A few weeks ago I was chatting to one of our neighbours who said she goes to a car boot sale every Wednesday morning. I love car boot sales, so I started asking her more details. We got talking about toys because she said every time she goes, she buys new toys for her two children – albeit second hand, but where on earth does she store all of those toys? I know her quite well, so I asked her if she minded if I came to have a look. When I entered her house I could not believe what I saw! The playroom was overflowing with toys – four huge barrels of soft toys and every other toy you could ever wish for in the hall, lounge and kitchen. I laughed, and invited her to come and have a look inside my house, and she was horrified! She could not believe that we only had one toy box in the whole house and jokingly said we were really mean. We were both laughing hysterically by the end – in absolute horror at how the other person lived. She thought I was crazy, and she thought I was crazy! I know I am pretty minimal when it comes to toys in our house – for selfish reasons – I hate seeing them and I can’t relax when they’re everywhere, and for personal reasons – I don’t believe children need a lot of toys and thankfully it’s something Jared and I wholeheartedly agree on. We love sitting it in the lounge at the end of the day with no toys in sight. I like basic toys. Toys that don’t take up a lot of space, can be played with in lots of different ways, promote creative play, somewhat educational, usually wooden and more beautiful to look at. These types of toys are usually a little more expensive than their plastic alternatives, but their longevity is far superior and they are treated with more respect. I don’t like battery operated toys because I find them noisy and annoying, plus they’re repetitive and therefore limit creative play. 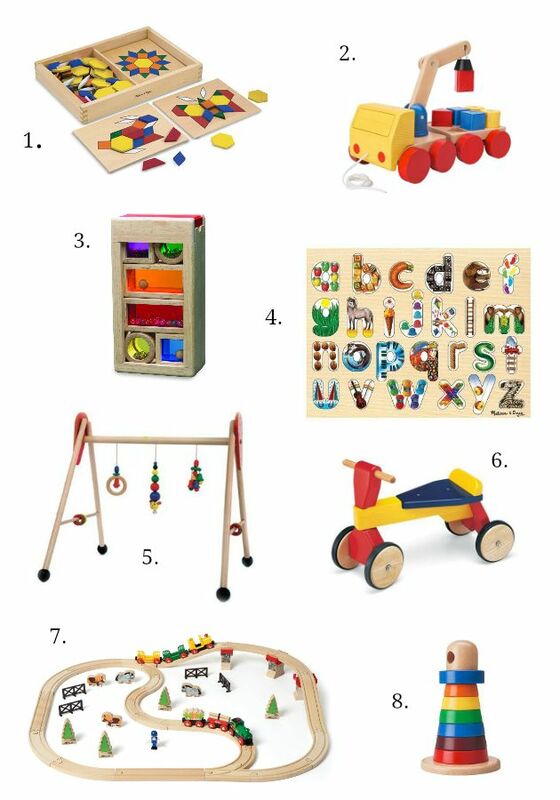 Popular toys like Lego, Duplo, Brio, Kapla, Schleich animals and Playmobil all fall into this ‘open ended play’ category. They can be made into towns, cities, cars, hotels, gardens, spaceships, towers, zoos, schools and absolutely anything else! They are built to last – the reason why they hold their value and are still so popular. We have one toy box in the lounge, one basket for the train track and the boys have three or four toys on their bedroom windowsill. That is it. 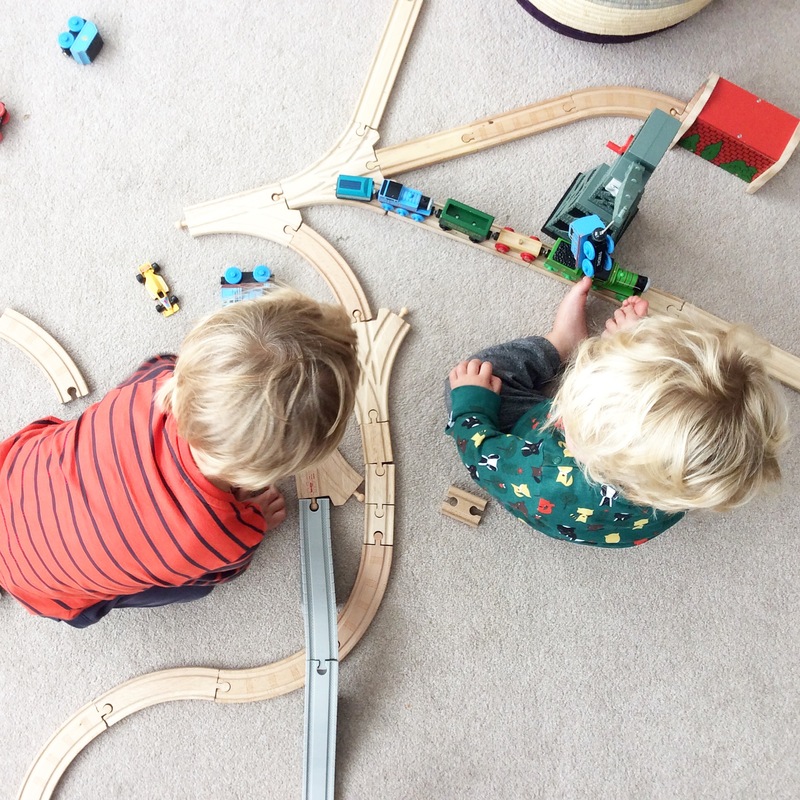 I think carefully before I buy any toy (apart from saying yes to small cars and trucks when we’re car booting or charity shopping) – is it worth the money, how long will it last, how many ways can it be played with, will it entertain different ages and what can we learn from it. I also think it’s good for children to be bored sometimes – my siblings and I ‘invented’ so many games through boredom and I suppose I want the same for my children. It also means that when they go to nursery and playgroup they are completely thrilled by all the toys there. When we have visitors the toy box is open and a total free for all, but when it’s just us we try to have two things out at once so chaos is kept at bay. Of course, there are days when this completely goes to pot and the house looks like it has been burgled! I know I must sound like a really boring parent, but there are so many other things they enjoy like drawing, painting, making dens, reading, baking and being outside, so toys don’t form a huge part of our every day. 1. We bought these puzzles for Winston last Christmas and he loves them. There are 10 different designs and he has to place the right pieces onto the wooden boards. They are good for shape recognition, colours, encouraging a steady hand and to watch how the shape comes together. 2. This truck is from Ikea and I bought it for £2 from a car boot sale. This is one that lives on their bedroom windowsill and both of them enjoy playing with it – Ru particularly. He has to fit the shapes into the wagon and can then use the crane magnet to remove them all. 3. We bought these Wonderworld blocks for Winston’s first Christmas. He didn’t take an interest in them for quite a few months but both of them enjoy listening to the different sounds, stacking them, fitting them back in the box and looking through them make everything change colour. 4. Maybe this Melissa & Doug jigsaw doesn’t count as open ended play but it has been so helpful in teaching Winston his letters and I think it is so pretty! It is far more interesting than looking at plain pieces of paper. When he was younger I would draw around all the letters on paper and then he would match the stencil to the jigsaw piece. Then we moved onto recognising the letters, saying the sound and matching it to the drawing. 5. I’ve mentioned Hess baby gyms before but I just love them! Only applicable from birth to walking, but I found it indispensable. Babies can lay down, sit up and play with the sides and practice walking with it. Both my boys learnt to walk using our Hess play gym. 6. This is the perfect trike for indoors and both of them love it. It’s made by Pintoy. Having one also teaches them to share (with varying amounts of success). I bought it from eBay for £20 as Winston’s main Christmas present the year before last. 7. Wooden train track. This comes out most days of the week. Win loves making exciting tracks for Ru (even though he doesn’t always appreciate them) and Ru loves having a go at fixing the pieces together. Win sits and thinks about how every end needs another end to join to, and it can constantly be expanded as you buy more pieces. My mum still has ours from when we were young. 8. Ru can’t do this Ikea tower properly yet, but he enjoys fitting them on over and over again. He likes trying different orders and the colours will be handy when he’s a little older. Duplo, cars, trucks and jigsaw puzzles are also popular. Win and I love playing Orchard Games when Ru is napping. I’ve just ordered a little buggy for Ru because he loves playing with dolls and putting his panda to bed. Although I’m pretty sure he’ll mostly use it to ram Winston. It appears that buggies can only be bought in pink or blue, which I found frustrating. What ever happened to green, red or yellow? Ikea, Wilkinsons, eBay, TK Maxx, car boot sales and charity shops are my go-to places to buy toys. There are lots of beautiful websites too, but they are usually a little more expensive. What are your thoughts on toys? Are you more like me, or my neighbour? This is not a sponsored post and my blog update is now scheduled for next week. All beautiful toys Est. I have come to learn to be less of a toy hoarder but do let them choose things they are into for birthdays and Christmas, but rarely pay full price, so megs loves her tinker bell fairies and E his nerf gun. On the whole I think they still have too many toys, though I am very aware there’s not as many as almost every other child we know and i still want to clear out too.